The tomato harvest continues and this week we picked several of the Soldackis and prepared them for later use. I decided to roast the tomatoes with a bit of olive oil some salt and pepper. A slow cook resulted in two jars of pulp. 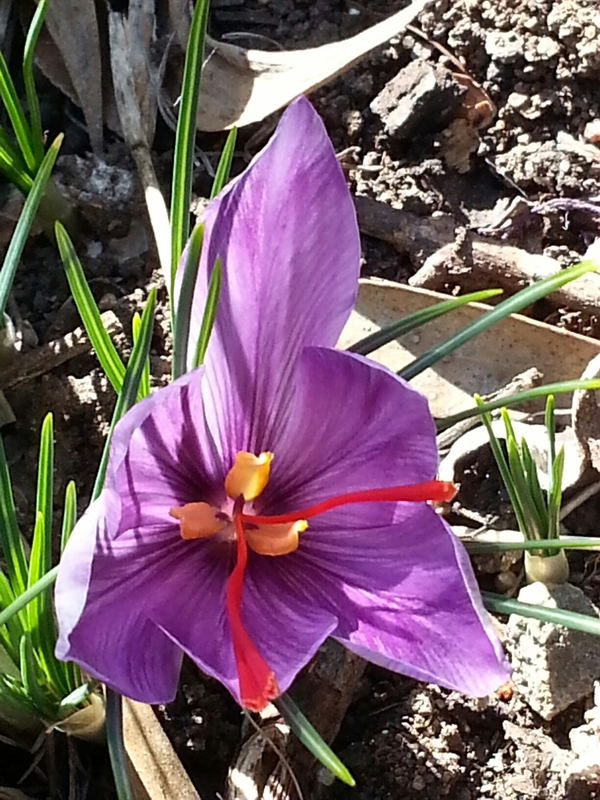 To date we have collected nearly 200 saffron flowers or about a gram of the spice. This is our largest harvest to date and we’ve even had to find a larger jar to store the threads in! We still expect to be picking flowers for another week at least. Our chickens are, for the large part, taking it easy. Of the four of them only the smallest new chicken, called Little Frizz, is laying eggs. It seems amazing that this funny little animal is doing all the hard work. I do worry that her poor feather coverage will make winter very hard for her. However it’s not all harvesting around here. Given that “April is for alliums”, as Tino was reminding us on Gardening Australia the other week, TB has been out planting onion seedlings and garlic bulbs. After a week the garlics are just starting to push through the soil and the onions are standing up. Like most of the south east of Australia the start of autumn has been hot and if not hot above average in temperature. Yet the nights are rapidly cooling. As a result we are currently harvesting both tomatoes and saffron. 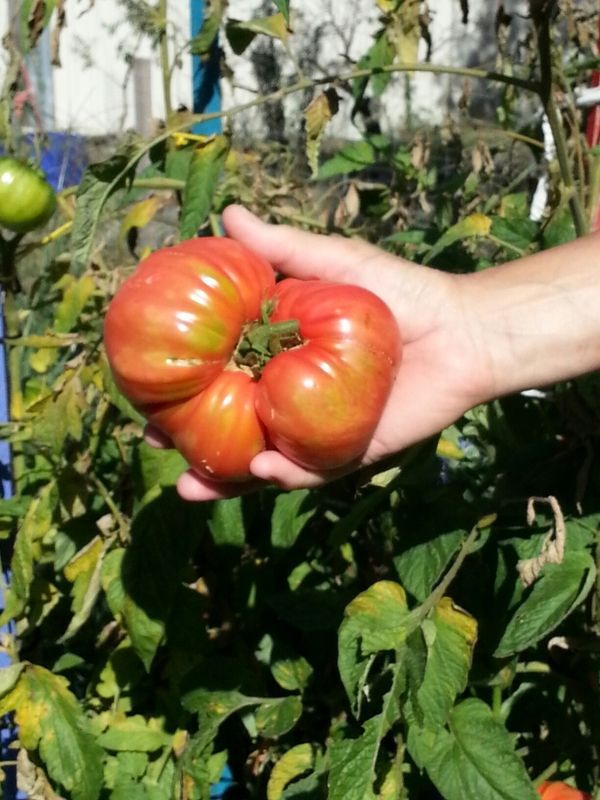 Our tomatoes are of the variety Soldacki, bred in Poland for a colder climate. The seeds were planted in October last year, but the seedlings only went into the ground during the last week of November. 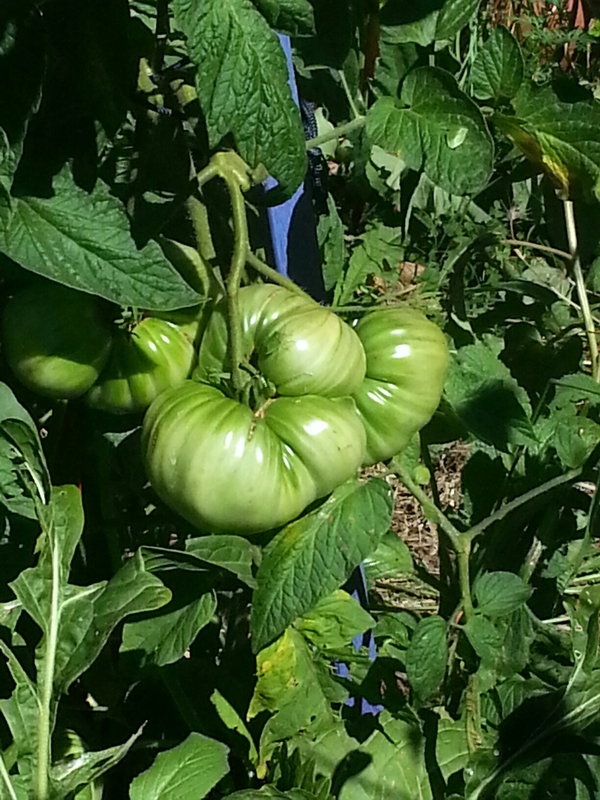 It’s been a race to see if the warm weather would hold long enough for us to harvest ripe fruit. We have watched as the fruit grew larger and larger.They have made it. This week we picked one of the fruit in the photo above. It weighed in at a whopping 630 grams (or 1 & 1/4 pounds)! Our saffron bulbs started poking their shoots aboveground only a week ago. Today we picked our first flower. Last year we harvested several hundred flowers. These bulbs really love Canberra conditions so we hope for an even bigger harvest this year. 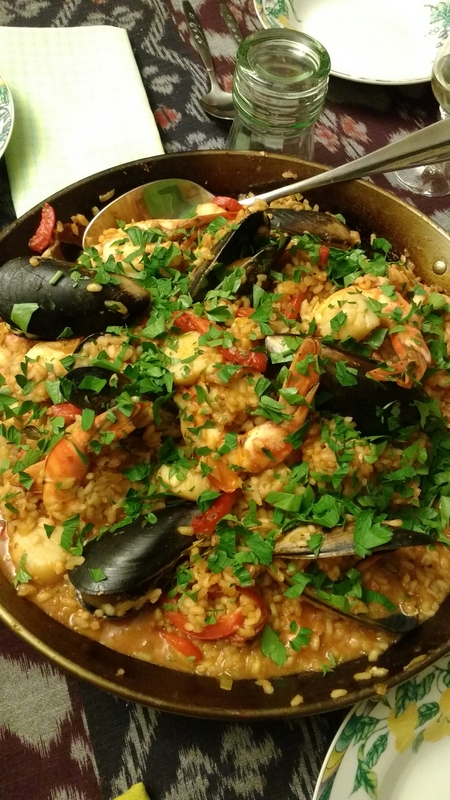 Last week we used some of what’s left of the 2015 saffron harvest to mske a really flavoursome paella.